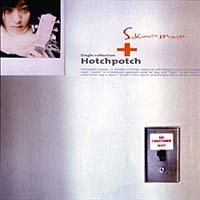 Album info: From the album liner notes… “Hotchpotch means: a number of things mixed up with Maaya’s order or arrangement. ‘Potch’ is a traditional Japanese name for dog and ‘hotch’ is the name of the most clever dog in Japan. ‘Potch’ is the typical sound expression to press a button.” ‘Most clever dog’ refers to Hachi, a dog who is now immortalized in a statue known as Hachikou outside Shibuya Station that has become Tokyo’s #1 meeting spot. There was also a North American version of this album, released on July 5, 2005. Links to translated interviews and/or articles related to this album collected here. Maaya’s liner notes: I put into this song everything I’ve come to convey through singing. Song info: English version is “Dreams in a Pie,” used as the ending theme to Napple Tale and found on the game’s Kaijuu Zukan soundtrack. Maaya’s liner notes: I’d finally arrived at this place without even being aware of it. And before I knew it, I’d met tomorrow’s boyfriend. Maaya’s liner notes: The happiness of believing in someone from the bottom of your heart. Maaya’s liner notes: I haven’t yet experienced a breakup as sad as this. Maaya’s liner notes: Have you tried to imagine the shape of your future self? I’d thought I was more of an adult at 19, me long ago. Maaya’s liner notes: “I am me. Maaya’s liner notes: I want to notice something sleeping inside me. Believing in possibility becomes the source of all power. Maaya’s liner notes: A sky more grey than blue. A sound more quiet than quiet. Maaya’s liner notes: Just from a slightly altered point of view on even everyday ordinary life, it seems like everything’s different. The city, the ocean, the water, the forest, and even my own toes. Maaya’s liner notes: I saw the shadow of one person standing amid the gloom of a vast stormy sea, the roar of swelling waves, the pain of the wind. Maaya’s liner notes: For me, this is a song exactly like medicine. It has always encouraged me. I’m sure it will be that way even after this. Maaya’s liner notes: I think meetings are fate. Meeting this song, meeting Youko Kanno-san, meeting Yuuho Iwasato-san, I met my current staff members. That was fate that could happen through many coincidences. And “esca” taught me that it will depend on me which I choose to keep after fate began.